The Epsom salt blend designed specifically for sports. 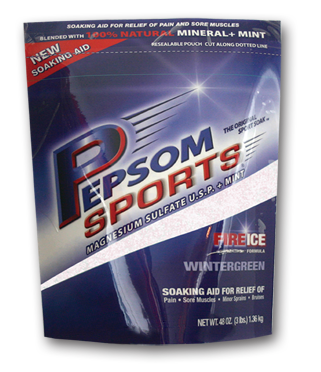 Pepsom Sports' FIRE*ICE formula combines the FIRE of Hydrotherapy with the cooling ICE sensation of 100% natural mint. Pepsom Sports' all natural formulations were recommended by an award-winning athletic trainer to help you beat the competition! The perfect soaking aid for all sports-related activity. 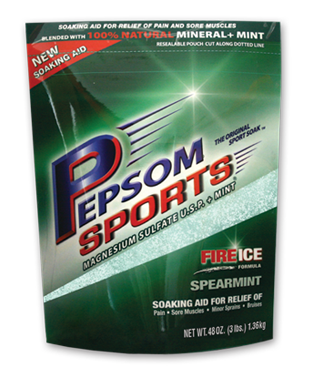 Soaking in a warm bath of Pepsom Sports helps relax muscles to prepare you for the game. Packed with the restorative qualities of Epsom salt, Pepsom Sports soothes tension and soreness to help your body recover faster. Great not only for pro athletes, but also for kids in youth sports. Coaches and trainers use Pepsom Sports because it can help reduce the risk of sports-related injuries for both adults and children.